The icon to the right is the avatar I've been using for the past five years. Before that, I'd been using an icon made from a photo we called the nose-biter. I think you can figure that one out. Ever since I started using avatars, I've really liked the idea that my online friends could identify posts by me quickly. I make it a point to try to use the same avatar at different sites, and I try to use an avatar that's somewhat distinctive. A couple of the things I liked about the old avatar was the predominance of the color blue, and that I wasn't doing a traditional head shot, but that it still suggested me by my physical appearance. I got the itch to make a new avatar, but I had a few guidelines in mind. I'm only getting older, so I'm even less interested in having to see my own mug head-on at the social sites I visit. In opposition to that, I still want my online friends to have at least a rough idea of what I look like, and I want the new avatar to be reminiscent of the old avatar. 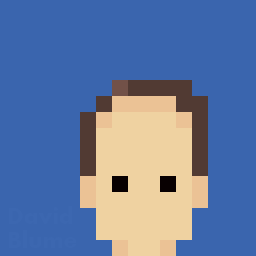 This time I was going to take a crack at a pixel-art version of myself. I'm a fan of Andrew Gleeson's artwork, and decided to take inspiration from his style. With any luck when my friends see my new avatar, their favorite chiptune song will spring to mind, and they'll recall good times playing fun, simple video games. I managed to retain the field of blue as the negative space around my head. And my head still only takes a small fraction of the space. It manages to be a straight-on head shot that suggests my physical appearance without actually being a photo of me. I think I can live with this for a while. Let's see how it goes! The baby biting my nose in the picture to the right is turning ten years old. It's hard for me to believe that I've been using that picture as my avatar across the web for so long. When I created that avatar, I chose a picture that delighted me. My daughter and I were playing a game that we both loved. I'd hold her with her head next to mine, and when she'd turn away I'd brush her cheek with my nose, to bug her. She'd turn back and playfully bite it. We'd both laugh. My wife caught the photo of us in the middle of the game. The original photo was nearly monochromatic already, and I thought I'd make it sepia-toned to give it an aged look. It seemed a good idea at the time, since because we had a new baby just about everything seemed renewed and full of wonder and color. A faux sepia-toned photo added some variety. Now, that ten-year-old sepia-toned photo is beginning to look, well, old. Not only can the baby in the photo read the blog about herself, she probably has her own twitter account. It's time for a new icon/avatar. There were a few things I really liked about the old avatar. I liked that I used the same one across multiple websites. That makes it easier for my friends to know that it's the same me at each website. I liked that I only took up about 30% of the image. At most sites that allow you to put up an avatar, you're going to be stuck seeing it yourself, so you'd better not mind. I don't want to look at a cheesy smirking headshot of myself when I check in at social networks. And even though I only make up 30% of the frame, I'm glad that it's me in there. I do want my online friends to have at least a rough idea of what I look like. So that was my criteria for the new photo, too. I want to use the same one across social networks, I want to be in the photo, but I don't want to have to look directly at my own ugly mug. My friend David D. posted a self-portrait on flickr that really captured my imagination. 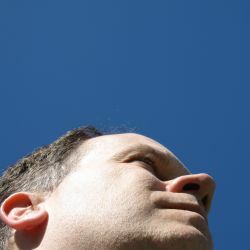 He only comprised a small part of the photo, yet there was just enough to suggest physical traits to recognize him by, and it had a brilliant warm blue sky. I tried to capture a similar shot, and this is the result. It meets most of that criteria. A couple of other aspects of the photo grew on me, too. I like the deep blue, and I like that since I'm facing to the right, for most social network posts that put my icon on the left, it looks like I'm looking at the conversation. I'm going to give this new icon a try. Let's see how it goes! A few days ago, I read Rob Walling's article, Why You Should Re-architect Your Career to Amplify Your Strengths, which explains that we'd be better off spending our time maximizing our strengths instead of fixing our weaknesses. He makes a strong case and applies it to the niche of software development, but it's a good idea in general, too. This is partly because it lends an air of sophistication, learning and tradition. But it is also because most people don't have the first idea what it actually means and so have to go to the effort of finding out. Once they have done this, any banality in the actual meaning is camouflaged. I already loved certain pseudo latin phrases like the names of the websites ars technica and vox machina. Just by having those names the websites hit the ground running with a certain level of sophistication. That translates to "By Skill and Hard Work." It jibes with Rob's article because it states that hard work won't get you all the way. One should work with one's strengths and apply their best effort if they want to achieve excellence. I also like the implication that the arte can help the product result in something beautiful. We would do well to have made something both beautiful and excellent.